Father’s Day is this Sunday, a day to honor fathers and celebrate their influence in our life. That influence is far reaching, and begins the day we are born and continues into adulthood. When it comes to exercise, eating healthy and keeping fit, some dads have gotten a bum rap. The term “dad bod” is used to describe dads who are less than fit, but that moniker tarnishes the image of dads everywhere. Dads can be sterling examples of fitness just like any other guys— although it takes better time-management skills than what is required of 20-somethings without kids and a mortgage. As a tribute to dads everywhere, and to inspire every man to become healthier and live longer, we’ve found three fit and tough dads, all mixed martial artists, who have reached the esteemed status of DadBod 2.0 by virtue of being positive and fit role models for their children. 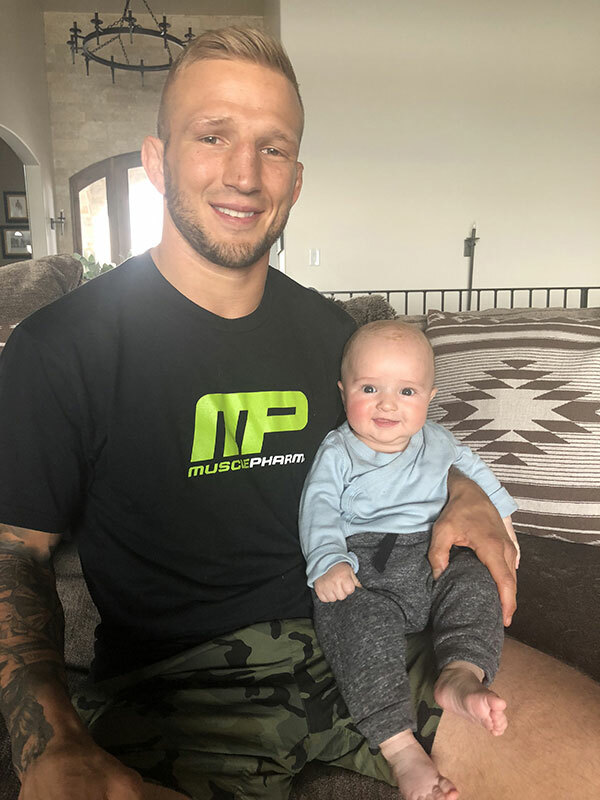 TJ Dillashaw is the current UFC Bantamweight Champion; Tom DeBlass is a black belt in Brazilian jiu-jitsu who has competed in jiu-jitsu/grappling; and Alan Jouban, a UFC fighter, are all MusclePharm athletes who combine dedication, consistency and effort with fatherhood. 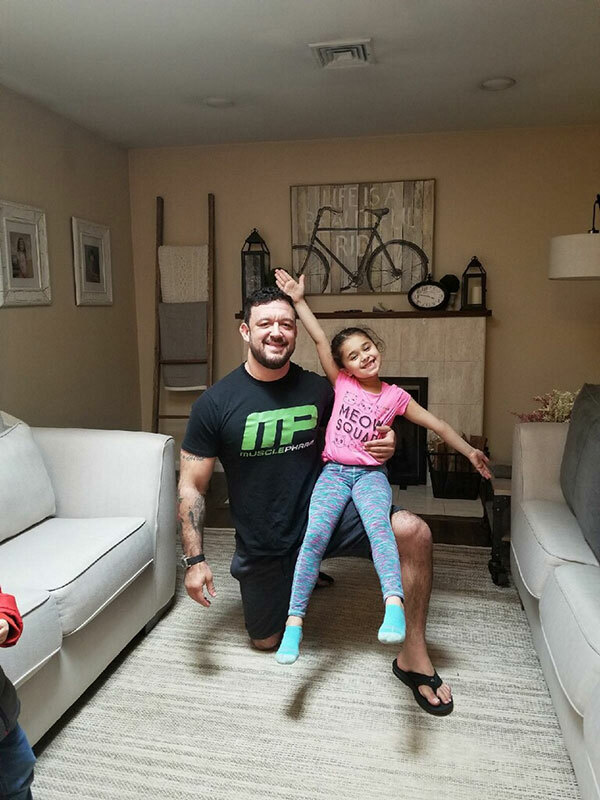 They talk about their training, nutrition, the positive influence on their children, and offer advice to dads of all shapes and sizes. What is your diet and fitness regimen? TJ Dillashaw (TJD): For workouts, I fit in about four to six hours five days per week, with two days off. I typically take Wednesday and Sunday off instead of going five days straight— this structure allows for peaks and valleys with my workouts. In regard to my diet, I prefer metabolic eating— ketogenic is the closest way to describe that— the difference is I need extra carbs to maintain my workouts. I also resort to simple carbs, not complex, because they break down easier. Tom DeBlass (TD): I train BJJ [Brazilian jiu-jitsu] five days a week and usually lift or do isometric exercises three days a week. In terms of diet, I do a form of intermittent fasting, which is 10 hours of food followed by 14 hours fasting. I actually have a DVD and book out on it! What about your kids— are they into fitness or nutrition yet? TD: They definitely exercise daily. Always doing handstands and running around. We try to have them eat well, but their diet is not strict. Do you feel as if your health routine is influencing (or will influence) your child/children? If so, how? TJD: Absolutely! When I grew up, I wish my parents were more into nutrition, given what my profession is now. I hope that, as my son gets older, he’ll move to more organic and home-cooked meals rather than eating out. TD: 100 percent; they see me exercising and training and they mimic me. It is really cute to see. What is the most important part of your health/fitness routine? TJD: The biggest changes I have seen have been from switching my diet and scheduling my workout load— hard Tuesday to Wednesday off, Saturday to Sunday off (hard and easy workouts). I like to schedule in a fashion that helps my body recover. TD: I think everything is equally as important, from my diet to BJJ to isometric exercises and lifting. What is your favorite workout supplement? TJD: All of the MusclePharm pre-workouts (Assault, Wreckage)— when I need a pick-me-up before the next hard grind. TD: My favorite workout supplement is MusclePharm BCAAs and Aminos, for sure. I also really like Wreckage in the morning rather than coffee. Did you value nutrition when you were growing up? TJD: I did not, but I wish I had. Being a pro athlete is what got me into nutrition. TD: I was always big in sports, so nutrition was very important. Do you feed your kids the same way you feed yourself? TJD: My son is still only 4 months old, so he’s currently taking breast milk, but eventually I hope he’ll move to a similar lifestyle with eating. TD: Not exactly— I keep my carbs a bit lower than they do. Do you have any suggestions for dads who have limited time and budget? TJD: Going back to basics— drinking only water and moving away from processed foods. Making time, even if it is a half hour, to do a low base (long cardio workout) so it is not too taxing on the body. The goal is to keep your heart rate at 130. TD: Yes: 40% fats, 40% protein, 20% carbs. And fast! 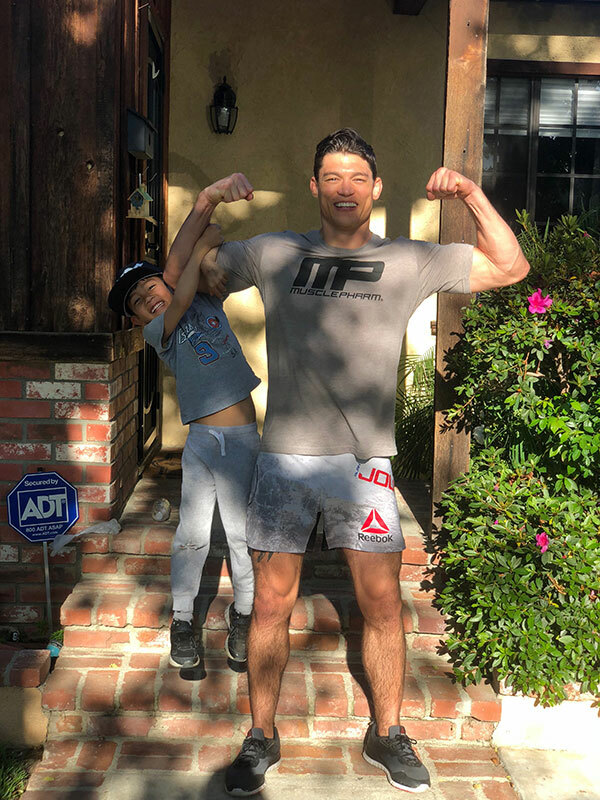 Alan Jouban (AJ): Take your dog on a walk with your kids, go for a weekend bike ride as a family, play basketball with friends— it’s important to make active choices on a day-to-day basis while still incorporating meaningful time with your family. I play some type of sport every day with my son Cage. It’s a way for me to incorporate those lifestyle choices with my son (and show him the importance of being active and fit), and still have fun with him. What are some lifestyle changes that can and should be made for those who are not currently prioritizing their health? TJD: Drink more water, not eating processed foods, avoid sugar, and find 30 minutes three times per week to work out. TD: Exercise at least three days a week— all you need is 30 minutes. Also, eat less starchy carbs and make better food choices. AJ: Involve your family with eating habits that you are choosing by cooking at home instead of going out, meal prepping for the week, etc. If you have sweet cravings, MusclePharm’s Combat Crunch Bars or Organic Plant-Based Protein Bar are great alternatives to sugary desserts— they satisfy my sweet tooth, and are even great for a post-workout snack. What do you suggest for dads who are starting at square one (i.e., already have a “dad bod”)? TJD: I suggest they go back to basics by drinking a lot of water, avoiding processed food and fitting in 30 minutes of physical activity. Next steps would be exploring supplementation around goals. Cold-pressed juices are also an easy way to eat a lot of greens. TD: I suggest they get their diet in check asap. Workout without diet doesn’t lose the weight. AJ: Dial back on your sweets and desserts, add more veggies at every meal, increase water consumption— a gallon a day is a solid goal— and get rid of soda and juices. Also, try to make time to work out at least three to five days a week. This can be anything from 20 minutes per day of jogging around the neighborhood or strengthening your abs at home, or an hour and a half of a Muay Thai routine. As long as you’re creating dedicated time to working out and making it a habit, your health (and body!) will improve. Do you have to work out harder as you get older? TJD: Yes you do. Your body is less forgiving the older you get, and hormone levels are lower. TD: Not at all; I actually work out less. It is my diet that has become better. I need more time for my body to recover.